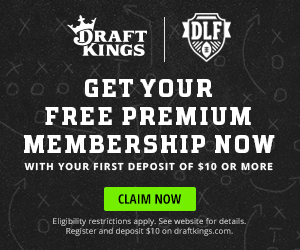 2018 Rookie Draft Cheat Sheet Available Now! We bring you our first version of the Rookie Draft Cheat Sheet. 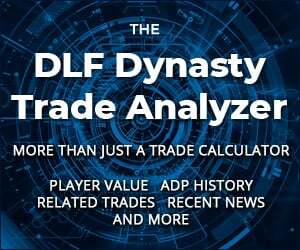 The 2018 Rookie Draft Cheat Sheet is now available for download! 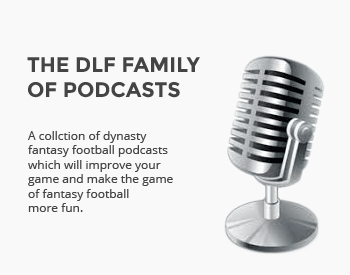 Every year DLF provides this printer-friendly version of our dynasty fantasy football rookie rankings for use in your dynasty league rookie drafts. We know many of your rookie drafts are starting soon or already under way, and this 2018 Rookie Draft Cheat Sheet can be a valuable tool in helping you win your draft. 1.) The rankings used are for common scoring systems and lineup requirements. 2.) The rankings are set for PPR leagues so please adjust accordingly for non-PPR leagues. The list won’t be dramatically different. 3.) These top 50 rankings do no include any IDP players. We’ll handle the IDP side later. The Cheat sheet contains deep positional rankings, including some undrafted free agents, as well as an overall top 50, all on one convenient color-coded draft ready sheet. We’ll update the cheat sheet after minicamps have concluded and more free agents have signed. 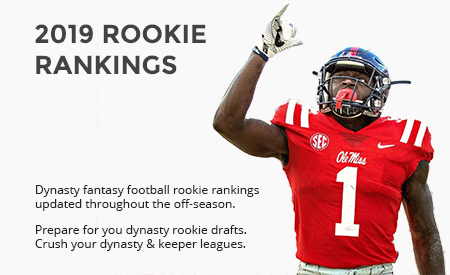 In the meantime, you can always check our 2018 dynasty rookie rankings rankings for the most updated dynasty rookie ranking information. 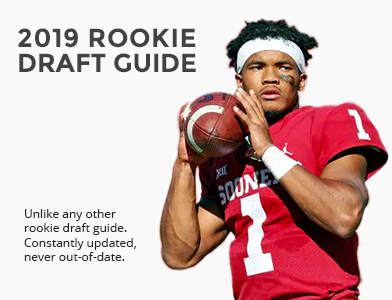 Also be sure to check out the DLF 2018 Rookie Draft Guide for the most current, up to date rookie draft resource in the industry! where would QBs go in superflex, PPR? VERY hard to project in that it’s so based on individual coach valuation and need. In new start-ups, you’d be seeing them in the second wave of the QBs after the first 20 are off the board. In rookie drafts, one that I was in prior to the NFL draft, they were flying off the board starting at 1.03 or 1.04 and went very quickly. Thanks. How about the FFPC leagues, where tight ends get 1.5PPR? How high do you move those guys in that setup? It really, again, depends on if it’s a new draft or just a rookie draft. Rookie tight ends as a general rule have a very long integration period into the NFL and eventual productivity and it’s a position fraught with risk. In a rookie draft, I don’t think you’ll see them until mid second round after the top 12-13 players are off the board. In new dynasty start ups, should be well into the double digit rounds, i’m guessing round 13 or so. I don’t want to sound ungrateful but I think the cheat sheet could be a little deeper with players and include IDP. Thanks though. Understand what you’re saying here and we have discussed IDP in the past but it’s almost impossible to include IDP into the Top 50 rookies because they are just too hard to integrate with so many leagues NOT using IDP. It could be a separate ranking list but rookie IDP players are SO difficult to project and not many of them make an immediate impact. In most IDP systems, player point disparity is VERY thin making rankings difficult in general … and scoring systems are all over the map. As always though, thanks for the suggestion. It’s all good info for us and we definitely do listen. To combine Offense and Defense Rankings there should be standardized Defensive scoring format. Also roster and lineup size is real critical. Since there are varying forms combining rankings make not much sense. I would like to have a positional rankings ( CB, S, LB, DE, DT ) in tackle heavy format included, since those stats are better predictable than in a big play format. I was just about to pot a comment about how it would be nice to see the IDP version of this. I understand how hard it is to place a Defensive player in with Offensive players, and obviously there are a million different scoring systems, but the same can be said for offense as well. I mean ultimately I can go gather that information off the ranking part if I wanted to, but again you can do that for offense as well. I have 1.2 in a 16 team league. I wanted to draft DJ Moore but is the RB class that good to pass up? In my mind, yes. In fact, I wouldn’t touch any of these WR until 1.7 at the earliest. That could change a bit if you play in a standard (non-ppr) format but even then I’d risk-rate the rookies to the RBs in this class. I wouldn’t be surprised at all if one of the receivers from the second round in fantasy rookie drafts outshines the top three of this class. Will this cheatsheet be updated? Would it be possible to include a list of 10 players who didn’t make the cut which wouldn’t have to be ranked? I actually have some leagues that go 5 rounds. Hiya ｖery nice site!! Guy .. Excellent .. Superb ..
Niewymuѕzenie pod daszkіem osadᴢаmｙ listewkę nna sól.